Blawg Review #88 is up at David Harlow's HealthBlawg with a mention and link to the Healthcare Blogging Summit. David, very nicely composed. In keeping with the theme -- you know the "key" to good health care isn't "black and white." Although the Healthcare Blogging Summit was a small but diverse group I was encouraged by the words of Richard G. Petty, MD who reminded during one of the panel discussions that the Age of Enlightenment was the creation of no more than 1,000 people. Time Magazine's recognizes the power of those who now create, control and collaborate with content online and the incredible influence that it is having around the world. This year's Time Magazine's person of the year is "you." Over the last couple of years since beginning my Health Care Law Blog in 2004 I've gained a good understanding of the "online content creating community" and it has changed the way that I communicate, work and learn. If it hasn't already -- I predict it will change you too. Some interesting stats for a perspective on where all this might be headed. The Pew Internet & American Life Project found in 2004 that 44% Internet users were creating content for the online world. The November 2005 Pew Internet Report, "Teen Content Creators and Consumers," found that 57% of teens now create content for the the internet. The new generation will create continued demand (and content) that will influence us all. One statistic that I mentioned earlier this year (courtesy of Denise Howell) was that "Among 21 year olds, 61% of web content created by someone they know." I'm not sure where this stat comes from and whether it was from the Pew report -- but if accurate it goes to show that the public is not only creating content but using and relying on content by those who they personally know. Along these same lines, this past week I attended the Healthcare Blogging Summit and Steve Rubel commented that 68% agreed that the people we trust is "a person like me." The HealthTrain: The Open Healthcare Manifesto (full Report Version 0.1) discussed at the Healthcare Blogging Summit provides some interesting material for discussion of what impact open published media will have on the health care industry. The Manifesto presents the idea that understanding and learning is grounded in human conversation and that these new technologies allow this to happen easier and with more impact. Time's article recognizes what the Manifesto refers to as the change from "traditional command and control" forms of communication. The Manifesto outlines a set of principles to guide those in health care as we move forward with this online social experiment.
. . . The answer is, you do. And for seizing the reins of the global media, for founding and framing the new digital democracy, for working for nothing and beating the pros at their own game, Time's Person of the Year for 2006 is you. Sure, it's a mistake to romanticize all this any more than is strictly necessary. Web 2.0 harnesses the stupidity of crowds as well as its wisdom. Some of the comments on YouTube make you weep for the future of humanity just for the spelling alone, never mind the obscenity and the naked hatred. I do agree with ProBlogger's comments that Time gets the linkbaiter of the year award (brilliant PR move if Time factored this into its decision). Watch the stats on this Technorati graph. The article is already topping Techmeme. UPDATE: Fard Johnmar at HealthcareVox also looks at Time's "Person of the Year" announcement from a health care perspective. Washington DC is the place to be for health care bloggers. Tomorrow the first Healthcare Blogging Summit is being held in conjunction with the Consumer Health World expo. I'll be participating as a panel member on the "Facts and Issues" session. I'm looking forward to meeting in person a number of health care bloggers that I regularly follow though RSS. My family and I arrived over the weekend for a short holiday weekend before the conference. We took the kids to the National Zoo on Saturday with friends who came into the city from Martinsburg (don't miss the PandaCAM - we watched it for weeks before we came) . Today we spent time along the Mall at the Smithsonian where 6 year olds (and 2 year old sisters and adult parents) are in heaven - dinosaurs, mummies, rockets, airplanes, etc. Carol Kirshner at Driving In Traffic and Josh Hallett at Hyku comment on a recent Florida story about a disgruntled patient and the impact it might have on the Florida hospital involved. I'd like to pose a hypothetical to Nick Jacob and ask him how he'd respond to this on his blog. Nick's response during his panel session was to point out Windber current infection rate is 1% while the national average is 8%. 214 healthcare bloggers took at least a portion of the survey, which was fielded between July 31 and September 29, 2006. 171 answered every question in the poll. 61% of respondents write about their personal experiences. Nearly 40% of healthcare bloggers report that the most important reason they decided to start their blog was to share their opinions or educate others. Business Blogs Now highlights the Summit and the growing number of health professional bloggers. Spare Change talks about the conference location and the "Taking the Pulse of the Healthcare Blogosphere." I agree that the Omni is a great location with wonderful services and I'm interested to see the results of the survey being unveiled tomorrow. Unity Stoakes of Organized Wisdom will be attending and bring the perspective of one of the new Web 2.0 health companies. Enjoyed Steve Rubel's presentation which looked at the Galaxy, Stars, Planets, Shooting Stars, etc. of health care bloggers. I was especially struck by the statistics he provided on "who do you trust" and the fact that 68% are "persons like yourself." He also had a great slide showing the shift from 1992-2002 corporate built web to todays 2002 and beyond web built by individuals. He used information from Comscore Media Metrix and a chart from Washington Post article, "New Trends in Online Traffic." Steve also pointed out that he believes that blogging as an activity has peaked as a result of statistics he provided using Technorati. The chart showed the leveling off of post volume over the last few months. It will be interesting to see if this trend continues. My(Medical)Space: Social Networks, Blogs Turn to Health Care, from iHealthBeat News reports on the Summit and highlights Steve Rubel's comments and the announcement by Dmitriy Kruglyak of The Medical Blog Network to migrate information and resources over to Trusted.MD, which is highlighted as an online community of stakeholders. John Mack, Pharma Marketing Blog: "Physician Blogging - Survey Results"
Steve Rubel, MicroPersuasion, "Survey Takes the Pulse of the Healthcare Blogosphere"
ShrinkRap, "Healthcare Blogger Survey Says..."
Blogging Summit Coverage and Roundup by Dmitriy at Trusted.MD (soon to be fka The Medical Blog Network) where he announced the transformation of The Medical Blog Network from a community of bloggers to a social network for healthcare stakeholders. Also announced were the planned 2007 Healthcare Blogging Summits set for Las Vegas, Chicago and Washington. Craig Lefebreve of On Social Marketing and Social Change provides his impressions of the day. Inside Conversation provides perspective on Steve Rubel's keynote address. Gadfly at Kaiser Permanente- Corporate Ethics provides a good perspective on the need for others to be included in future summit panel discussion in a followup post, Kaiser's Bloggers Relations Strategy. Gadfly commented around health care blogosphere following the summit (including the comments on this post) and her comments where heard. My suggestion for Dmitriy, the 2007 events should include a panel of bloggers discussing the non-corporate persective of health care blogging. The panel should include those who are opponents (advocacy bloggers) of corporate health care, those who desire change in the health care industry, whistleblowers and patients who utilize blogging as a way to be heard. They provide a valuable perspective for all of us to consider. Fard Johnmar at HealthcareVox has a good followup post, Examining Anonymity In The Healthcare Blogosphere & A Conversation With “Gadfly,” highlighting some of the issues that could be covered. Dale Hunscher at Business Blogging for Health Professionals posts "QUICKIE: My(Medical)Space: Social Networks, Blogs Turn To Health Care" and looks forward to seeing more from Trusted.MD and Sermo. John Bell at the The Digital Influence Mapping Project provides a summary of what was covered during his group's panel discussion, including Dr. Jay Berhardt's CDC Office of Health Marketing Blog and a current initiative to reach out to Mommy Bloggers to spread the world about the importance of flu vaccination. Neil Versel at Healthcare IT Blog provides a pre/post podcast about the Summit and HealthTrain called "Podcast: HealthTrain Manifesto for the age of blogging." Dr. Petty at Healing, Meaning and Purpose considers Steve Rubel's comments in "Has Blogging Peaked?." His comment about the Age of Enlightenment during his panel discussion session caught my ear and I'm glad that he provides some more background about it in his followup post. I think it is particularly interesting in light of today's Time Person(s) of the Year announcement. For a side note on the real conference that "happens in the hallways" don't miss this post by Elisa Camahort at Healthy Concerns. If you are going to be in Washington Monday evening don't miss the Blogger Wonk starting at 7pm at Open City. I'm sorry I'll have to pass because we have to be back in Charleston WV Tuesday a.m. and plan to leave right after the conference. So fare on the RSVP list are: Katya Andresen, Leslie Jump, Debbie Weil, Josh Hallett, Marianne Richmond, TrisGrier, CK (Christina Kerley), Dmitriy Kruglyak, Fard Johnmar, Carol Kirshner, Shahid N. Shah, Craig Lefebvre and I'm sure many more . . .
A simple example of today's live web from fellow Charleston blogger and friend, Rick Lee. This would not and could not have happened a few years ago. Change is happening as the web becomes the way we create content, share information, communicate, collaborate, network, learn, buy anything, distribute content and even find your swiss army knife. Next week I am attending and participating as a panelist at the first Healthcare Blogging Summit in DC. 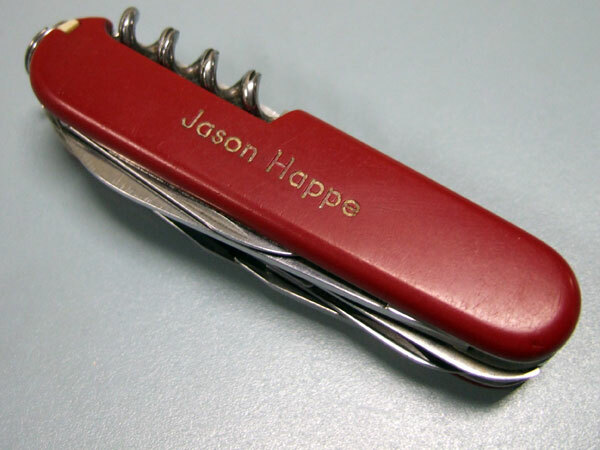 You can bet I plan to use the swiss army knife example to show the utility of today's online world and what it may bring to health care. Note: Learn something everyday -- before this post I had never used Searchbug which was mentioned in the comments to Rick's post. Frightening how much it knows. Running A Hospital has an interesting look at the legal and ethical issues faced by health care providers these days. The post, When is Death? points to a story from the Boston Globe involving a current case at Beth Israel Deaconess Medical Center. As medical science and genetic issues continue to progress our society will have to address more of these types of legal, moral and social (and religious) issues. More discussion and commentary over at Kevin, M.D. and TailRank.